Our favorite “baby” of the family had his birthday August 31st. 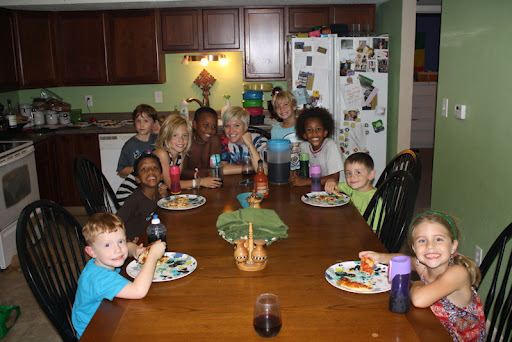 Because his is the last birthday of all the kids I will admit it often feels a little like an afterthought. I’m pretty sure on the 30th I turned to Zach and said, “Did you realize it’s Bean’s birthday tomorrow? What should we do about that?” And after 4 other birthday parties for the year I’m basically too tired to even feel guilty. Thankfully Bean is, bar none, the most easy going with those kinds of things so he didn’t hold a grudge. School had started so by the time I picked up donuts and Zach and I started descending the stairs singing “Happy birthday” the kids were in full hurry-get-ready-for-school mode. Except Bean. That precious boy knew it was his birthday and knew we would “wake”him up. 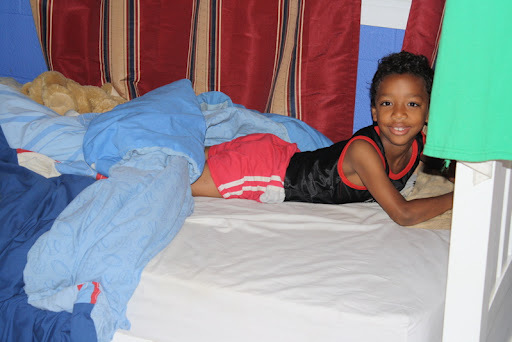 So in his bed he stayed, for probably 10 minutes, while his siblings rushed around to get ready for school. Love him for that. Donuts. Of course he wanted donuts. Binyam doesn’t eat much of anything throughout the day unless it involves sugar and/or chocolate and, preferably, both sugar AND chocolate. 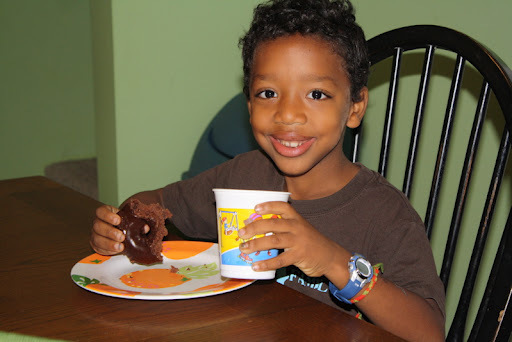 Binyam wanted cupcakes for his school snack. There’s an awesome local cupcake shop a mile from his school that I knew would do it up right for this special guy. When we got to school I was thrilled to hear he had asked his teacher and classmates to call him “Bean”. It’s what we call him and he definitely sees it as a term of endearment. Made my heart smile knowing he already felt loved enough in Kindergarten to deem that nickname appropriate. Pictured here with his “crown” chair. 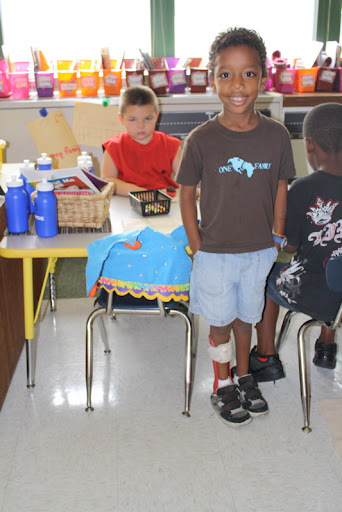 His teacher came up to us at Kindergarten round up and said, “I am crossing my fingers I get Binyam in my class. He is so amazing.” It was then that I decided I’d cross mine too. Anyone who sees the goodness in this boy immediately is someone that I can trust with his precious heart. 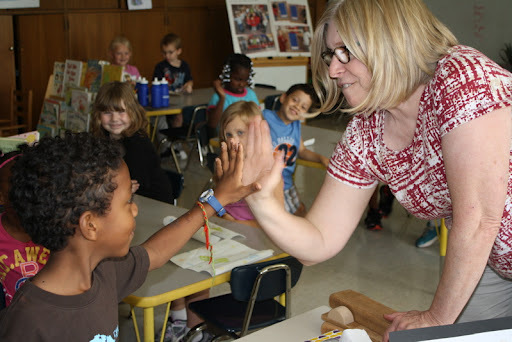 Here Bean’s teacher gives him 6 birthday high fives. Binyam is so like me in that we know love when it shows up. All he wanted, always, for his birthday was a sleepover. And he was very specific about who he wanted. His cousins Oliver and Eli. His best friend, Maddox, and Maddox’s big brother, Charlie. Because I love all of those boys with all that I am and I knew it’d be fun to get special time with them for me too, I was ridiculously excited for the sleepover. Zach and I made our homemade pizza, poured ourselves a glass of wine and then celebrated with abandon this life we are so blessed to come alongside. Annnnd I’m already crying. I don’t know what it is about Bean that makes me so overly emotional. I don’t know if it’s because he’s my “baby” that makes me feel so fiercely protective of every part of his being or if it’s because I’ve had the flu for the better part of this week (which explains the lack of punctuation and edited photos). Anyone who knows him will attest to the fact that they feel for him in exactly the same way. Because he had a miserable start to life. If you can imagine the worst start to life, he had it. His birth member described Bean’s pregnancy as “worst possible scenario”. And then he came out with club feet and the world crumbled around him. But knowing him now I can tell you that he’s made conscious decisions to not let any of that define him. I know that because he is light and love. Because he’ll laugh, loudly, just because everyone around him is regardless of whether or not he knows why they’re laughing. I know it because he rocks a bright red brace on his leg every day. He wears it so proudly and boldly no one has teased him about it. How could you tease something someone is so proud of? I know it because I know him. I know him as the little boy who shuts down the minute he thinks someone is upset or frustrated with him. His big, precious lips form a pout and the only thing that will shake him from it, the only proven method is getting him to smile. You get him to smile? And he breaks. After that you can talk rationally about what’s going on. He and I are good at this dance. We are down to just a few minutes of it. Because I get it, I get him. And I freakin’ love him like crazy. I wasn’t there for his birth, I wasn’t there for his first breath but darn it if I don’t feel his life with every beat of my heart. I’m so thankful for that scary, wild day 6-years-ago. I’m so thankful I get to call him my son. I’m just so, so thankful for him. Happy birthday my precious Bean. This entry was posted in Adoption, Binyam, Birthday. Bookmark the permalink. ← Is anybody alive out there? What a beautiful tribute to a beautiful boy from a beautiful mother. Happy happy birthday, Bean! Happy Birthday to your Bean. This makes me want to cry in a good way. Oh Tes, what a beautiful post. I love your Bean too, how can you not with that smile shouting out to the world? You are not a flawed mom, you are an amazing mom! He is an absolute joy. Absolute.Happy Birthday Bean. Hope you have a spectacular 6th year. This definitely got me choked up, too. He's adorable – especially in the photo standing in front of his desk – and I gotta say, the boy behind him in the orange shirt looks a little jealous! Beautiful. From a beautiful woman about a beautiful little boy. Happy Birthday! I LOVE the "hands in pockets" photo of him at school. So funny. You know how much I love all your kiddos, and I'm so happy that I can shout "Happy Birthday" from afar to sweet Binyam.